Ducks Unlimited supporters are the kind of people that want to make a difference in the world. They are dedicated to leaving a legacy of healthy habitat and abundant wildlife for our children and grandchildren to enjoy. For some supporters, like Jesse and Helen Roush, the best way to do that is through Ducks Unlimited's Feather Society. Whether it's a cash gift or estate planning, the generosity of this philanthropy goes above and beyond the call of duty. Thank you, Jesse and Helen, for giving and doing more for Ducks Unlimited and our conservation mission. As a retired restaurant business owner Jesse Roush has built many friendships and relationships with the community over the years. In fact, there was one friendship that introduced Jesse to wonderful world of waterfowl and now, over thirty years later, he is still an avid waterfowler. Jesse's appreciation for the great outdoors and his need to generate retirement income has culminated in a wonderful gift through a charitable remainder trust with Ducks Unlimited. "I wish we had known years ago how easy it would be to build funds for retirement and help protect the natural world," says Jesse. The scene was set many years ago, when a customer came into the restaurant and asked to borrow $8,000 from Jesse. The loan was never repaid in cash, but as Jesse says, it has been repaid many times over simply for the amount of joy it has provided. The "loan" secured a space at a duck camp in Iowa and was one of the best investments Jesse believes he ever made. "I fell in love with the joys of waterfowling. Everything from the early morning sunrises to training my labs. We decided to make this commitment to Ducks Unlimited for more than just the ducks, it's for everything else that comes down the pipe," Jesse says. "You've just got to say, 'Wow, how can I make sure the next generation gets to see the same thing?'" The couple decided to fund a charitable remainder trust for its multiple benefits: an income tax deduction, lifetime income with growth potential and the satisfaction of supporting conservation. "Ducks Unlimited made the process easy," says Jesse. The couple lives in Iowa. Ducks Unlimited's gift planner easily accommodated Jesse's request to set up the trust by mail. Today Jesse and Helen receive a regular stream of income from their gift and have the option of making additional contributions to their trust over the years. "The tax deduction helps considerably," says Jesse. 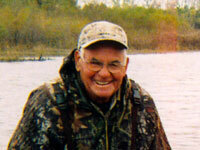 "Ducks Unlimited gave us a wonderful way to provide for our old age and promote a good cause we believe in. Now while we're still alive, we see the progress Ducks Unlimited is making - and enjoy the fruits financially." Whether you want to supplement your retirement income, diversify investments, save on taxes, or leave a legacy for loved ones, our Gift Planning professionals will work with you one-on-one to develop a personalized gift plan that's right for you; A plan that reflects your financial and philanthropic goals and ethics. Explore all your giving options today at www.ducksgift.org and for a personal proposal, please contact our National Gift Planning team at ccole@ducks.org or 1-800-453-8257.